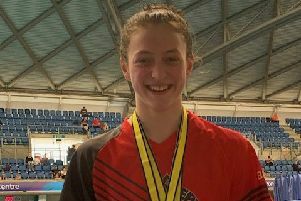 Huge disappointment turned to sheer delight for City of Peterborough Swimming Club (COPS) after the final round of the East Midlands League in Cambridge. COPS missed out on a top-two finish in the final standings for the first time since 2011 and their hopes of a sixth consecutive appearance alongside the country’s elite swimming clubs in the Natioanl Arena League Cup Final in Cardiff in April had been dashed. Champions Milton Keynes and runners-up Northampton took the two qualifying places with COPS a close third. COPS, however, were later handed a reprieve when Northampton announced they were unable to compete in the final. COPS gratefully took their place and will line up in the B Final in Cardiff on April 8 alongside Chelsea & Westminster, Hillingdon, Ealing, Thanet, Sevenoaks Hatfield, City of Liverpool, Swansea Aquatics and Boldmere. COPS went into the final round in third place knowing they needed to beat City of Milton Keynes by 20 points and Northampton by 12 points on the night to claim a coveted Cup Final berth. But, despite a herculean effort at a highly charged Parkside pool in Cambridge, they came up just short. The final result was: Milton Keynes 207pts, COPS A 203pts, Northampton A 197pts, City of Cambridge 167pts, Lincoln Vulcans 136pts, West Suffolk 135pts. COPS won 16 of the 50 events with Mollie Allen (18) and Poppy Richardson (15) both achieveing two wins. Further individual wins came from Rebecca Burton (18), Liam Knight (22), Daniel Leigh (17), Rachel Wellings (16), Harvey Norman (15), Myles Robinson-Young (14) and Connor Walker (12). Also swimming for COPS were: Anna Blakeley (14), Fabian Brudnicki (12), Stuart Clarke (34), Zane Day (10), Cameron Fisher (13), Sophie Griffin (12), Anastassja Herdien (11), Brenna Howell (12), Herbie Kinder (14) Jessica Mahoney (11), Joshua Martin (10), Amelia Monaghan (14), Matthew Newson (13), Amy Paget (11), Bert Papworth (11), Jamie Scholes (16), Jessica Shaw (11) Joshua Smith (11), Will Steel (15), Hallie White (13) Thomas Wiggins (17), Mackenzie Whyatt (14) and Eve Wright (13). The COPS B team won the C final at the Regional Pool to preserve their Premier Division status. The final result was: COPS B 229pts, Sherwood Colliery 191 pts, Northampton B 181 pts, Louth 167pts, Bramcote 144pts, Deepings 127pts. Mia Leech (14) and Matthew Gray (16) won two events with Lauren Harrison (15) and Henry Pearce (14) also victorious. Also competing for COPS B were: Ruby Blakeley (9), Stella Blakeley (12), Matthew Brigham (20), Lauren Browne (13), Michael Drinkwater (11), Tristan Earl (15), Laura Fehrenbach (11), Taylor Goodby (18), Erivan Hamid (12), Safford Hewitt-White (10), Emma Leslie (15), Ella McGhie (12), James Rothwell (12), Matthew Rothwell (14), Harriet Salisbury (12), Bethany Saunders (17), Maddison Saunders (15), Joshua Spencer (11), Tom Stokes (23), Mia Turvey (10), Harry Whiteman (16) and Matthew Wouldham (15).